Seat of the Bishop of London and "parish church of the British Commonwealth," St. Paul's Cathedral is the largest and most famous of London's many churches. Located on the site of a Roman temple, the present structure was built after the original church was destroyed in the Great Fire of 1666. Designed by Sir Christopher Wren, the resulting masterpiece is today one of Britain's most recognizable landmarks. Wren's version of St. Paul's was begun in 1675 and completed in 1711, approved only after long wrangling with the church commissioners, who turned down his first two designs. The result was a compromise between Wren's original idea of a dome and the commissioners' preference for a plan in the form of a cross. As built, however, St. Paul's is undoubtedly Wren's masterpiece. It's also a Renaissance church of spectacular dimensions: 515 feet long and 227 feet wide across the transepts, with two 212-foot-high towers and a magnificent 365-foot dome. Since the repair of damage suffered by the cathedral during WWII and the cleaning of the façade to remove 250 years of accumulated grime, St. Paul's has been fully restored to its original majestic beauty. No visit to St. Paul's would be complete without scaling the interior of the dome. All told, you'll face 528 steps to the top - a height of nearly 365 feet. 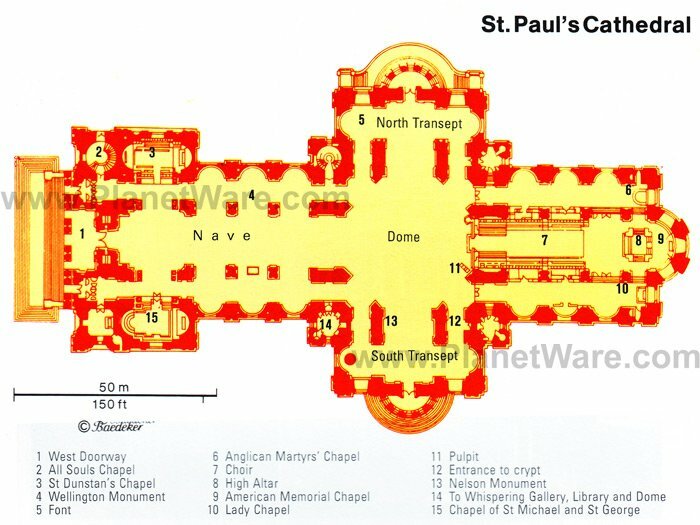 One of the largest such structures in the world, St. Paul's dome weighs almost 65,000 tons and consists of a unique three-dome structure, including a decorated interior dome, a middle dome built of brick (and largely unseen) for strength and support, and the exterior dome. Stunning 360-degree views are available from the exterior platforms accessible from both the Stone Gallery and Golden Gallery. There are 259 steps leading up to the spectacular Whispering Gallery, which runs around the dome at a height of 100 feet. It's so called because of its remarkable acoustic properties (it's possible to hear a whisper from across the dome's total width of 112 feet). From here, visitors can see Thornhill's paintings up close and gain a breathtaking impression of the size and proportions of the nave far below. From the Whispering Gallery, a further 117 steps lead up to the Stone Gallery around the outside of the dome, and a further 166 steps above this is the Golden Gallery. It's from the nave - the long main section you walk along after entering the cathedral - that visitors get their first breathtaking glimpse of the interior of the Dome. Both a ceremonial and public space, it's where you'll see the huge 30-foot-tall Great West Door, as well as the eight scenes from the life of St. Paul painted by Thornhill. In the north aisle stands an imposing monument to the Duke of Wellington, as well as two groups of statues representing valor and cowardice, truth and falsehood. St. Paul's is also home to a number of interesting chapels, most of them accessible from the nave. All Souls' Chapel is a memorial chapel dedicated to Field Marshal Lord Kitchener, while adjoining St. Dunstan's Chapel (reserved for private prayer) has a 17th-century oak screen and a mosaic by Salviati. Other chapels of note include one dedicated to St. Michael and St. George, the Middlesex Chapel, and the American Memorial Chapel commemorating the 28,000 Americans killed while traveling to (or stationed in) Britain during WWII. Two others are in the crypt: the Knights Bachelor Chapel and the OBE Chapel. In addition to its choir stalls by Grinling Gibbons - of particular interest due to their fine oblong panels with carved foliage ornaments in pear wood - the choir boasts a magnificent high altar built from sketches left behind by Wren. In the south choir aisle are the Lady Chapel and a statue of poet John Donne, the only monument from Old St. Paul's to survive the Great Fire of 1666. The vast crypt contains the tombs of many notable figures, including the painters Constable, Turner, and Reynolds. Under the south aisle lies the simple tombstone of Sir Christopher Wren, as well as the tombs of two of England's greatest heroes, the Duke of Wellington and Lord Nelson (the latter's coffin was made from the mast of the French flagship L'Orient). A must-see while visiting St. Paul's is Oculus, a fascinating 270-degree film experience outlining the cathedral's 1,400 years of history. Also on show in the theater in the crypt are Resurgam: I Will Rise Again, a short film showing the devastation caused by the Great Fire and the Blitz; Virtual Access: The Dome, a short film featuring the cathedral's magnificent domes; and Virtual Access: The Great Model, a bird's-eye view of Wren's famous model of St. Paul's. The Cathedral Library houses St. Paul's superb collection of more than 21,000 books and manuscripts dating from 1690 (earlier works dating as far back as the 1300s were destroyed in the Great Fire). As it's name suggests, the Object Collection contains numerous artifacts associated with the history of St. Paul's and includes models, paintings, and archaeological findings, while the Architectural Archive contains papers and drawings charting the building's design and construction. Admission to St Paul's includes use of excellent hi-res, touch-screen guides that feature film footage, images, interviews and commentary relating to the cathedral. A version is also available for families that includes quizzes and fun interactive games. Guided tours are also available and are included in the price of admission, and provide access to areas usually closed to the public. The Montague on the Gardens: 4-star luxury, Georgian buildings, elegant decor, individually-decorated rooms, upscale restaurant and lounge, afternoon tea. Apex London Wall Hotel: mid-range pricing, stylish decor, complimentary snacks, Bose iPod docks, chic restaurant. The Hoxton, Holborn: affordable boutique hotel, cozy rooms, rainfall showers, complimentary water, hip restaurant. hub by Premier Inn Spitalfields, Brick Lane: budget hotel, bright rooms, comfy beds.